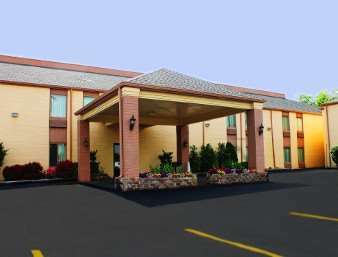 Have a Blast in Bloomington Off I-55 and I-74 near Illinois State University Our Days Inn and Suites Bloomington hotel is conveniently located off exit 160 on I-55 and I-74, near Illinois State University, Heartland Community College, and Illinois Wesleyan University. If you are traveling for business, State Farm Insurance, COUNTRY Financial, and other corporate offices are in the area. Concert and event attendees have easy access to the U.S. Cellular Coliseum, and the Central Illinois Regional Airport -BMI- is also nearby. Fresh Amenities Enjoy free breakfast and free WiFi Wake up to a free enhanced DayBreak breakfast with healthy options, and check your morning e-mails on free WiFi. Our hotel also offers conveniences such as free large-vehicle parking, access to our fitness center, and onsite guest laundry services. Each room features a private hot tub, sitting area, flat-screen HDTV, mini refrigerator, microwave, coffee and tea maker, air-conditioning, and ironing facilities. Pet-friendly rooms are available for a nominal fee.